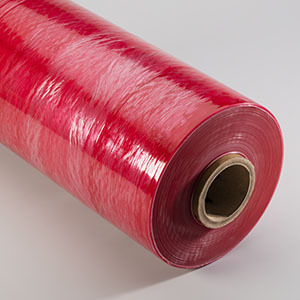 Stretchtape’s specialty films are uniquely designed to best serve several common industrial uses. Each industry has specific needs for the films they use, whether that involves anti-static properties to bind electronic products, one-sided cling for pallets that need to be stacked closely together, or UVI film for outdoor use. Stretchtape’s anti-static film contains an anti-static additive to prevent the accumulation of ion and electron charges. This reduces clinging, tearing, and dust build-up caused by static. Static charges can occur on any product, but pose the most risk to highly sensitive electronic components. 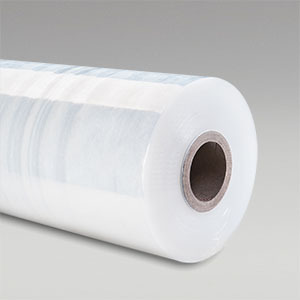 Anti-static stretch film protects packages from damage caused by electrostatic discharge (ESD). This makes the film ideal for uses in markets or environments which require an ESD Protected Area (EPA), or, an area in which all objects within the area are kept at the same electric potential, meaning there is no presence of static. Anti-static film eliminates these packaging headaches. Anti-static film is most often used in industries and markets requiring storage and protection of sensitive electronics. 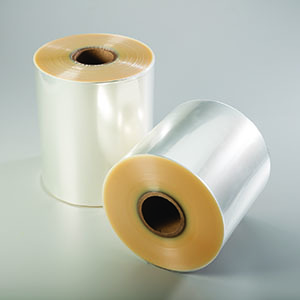 Stretchtape’s biaxially oriented polypropylene (BOPP) film is a variation of polypropylene and is often used for stickers and labels, among many other uses. BOPP films are also safe and long lasting. The films are generally clear but can be created with matte or white finishes. Due to the material’s moisture-resistant properties, the film is often used in beverage packaging, medical packaging, and as a tamper evident film. BOPP films are also used for lamination, textbook wrappings, adhesive tapes, and flower packaging. The film is manufactured by a dual oriented system which pulls the film with a cross-directional technique, increasing the film’s stiffness and tensile strength. The films’ resistance to tears and moisture resistance makes the film one of the most popular worldwide. The film offers a high gloss finish and is chemical-resistant. The transparent finish makes the film ideal for the beverage industry and retail packaging. BOPP films are designed to be unaffected by extreme temperatures so there is no need to worry about wrinkles or shrinkage. 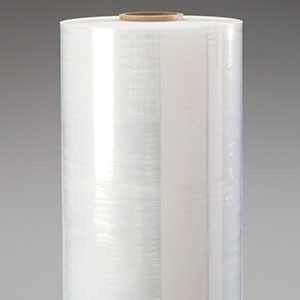 Stretchtape offers one-sided cling hand film and machine film. One-sided cling (OSC) refers to the process of establishing cling on one side of the film and not the other. OSC film prevents wrapped pallets from sticking to each other since only the inside layer of a wrapped pallet has cling. The outside layer is a cling-free surface. Since stretch film only adheres to itself, this also means that the product will not be damaged or ripped when the film is removed. Pallets sticking together occurs most often in high humidity conditions with multiple shipping units in very close contact with each other. It’s also a frequent experience in other packaging industries with tight containment spaces during packaging or transport. When pallets stick to each other, they need to be pulled apart, often causing damage to the film and potentially requiring rewrapping. OSC film provides a reliable way of wrapping pallets to ensure that unloading of transport is trouble-free. When pallets wrapped with OSC stretch films come into contact with each other, they slide past each other with no damage to the load or the stretch film. When preparing to wrap with OSC stretch film, the packaging design on the rolls eliminates any guesswork and informs the users as to which side has the cling component. Stretchtape’s OSC can be customized for almost any stretch film. Stretchtape’s PVC film, also known as polyvinyl chloride or vinyl film, is an ideal binding solution for the construction industries. 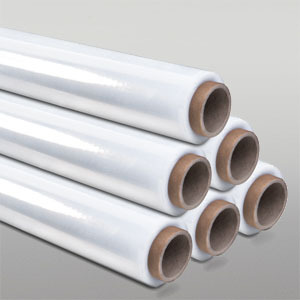 PVC film is extremely strong, puncture resistant, and has excellent clarity. It can be seen used for refrigeration units and is known for being extremely flexible and durable, and having great tensile strength. It is an economic solution for applications needing resistance to certain chemical, alkalis, and environmental degradation. In some cases, it can be used for insulation for electrical wiring, or in areas needing to maintain sterile fields, such as for medical environments. Due to its low melting point (film starts to soften at about 140 degrees F/60 degrees C), the film is not the best option for extended outdoor use. Stretchtape’s Ultraviolet Inhibitor (UVI) films offer specific protection for palletizing items that will be outdoors or exposed to UV rays for extended periods of time. UVI films contain ultraviolet inhibitors which are added during the manufactured extrusion process. This dramatically slows the film’s degradation in high UVI environments. UVI films maintain their strength over a longer lifetime than standard films, especially for outdoor storage. UV exposure occurs not only from sunlight, but also some artificial lighting and electronic devices. Extended exposure to these elements can dramatically affect the performance of stretch film. UVI films are commonly found in the lumber and composites, building and construction, and moving industries. 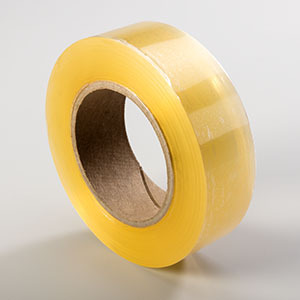 Stretchtape’s Volatile Corrosion Inhibitor (VCI) film is a heavy-duty film with a corrosion inhibitor. It has a very high barrier resistance against oxygen and moisture, making it ideal for wrapping all kinds of metals, particularly steel. Corrosion and rust can occur when products are exposed to changes in temperature or humidity levels. When water, oxygen, or humidity is in contact with an unprotected metal, oxidation forms on the metal surface. This reaction is severely slowed and in some cases, completely halted, by incorporating a VCI film for product wrapping. Stretchtape’s VCI films protect products and packages from corrosion damage for both ferrous and non-ferrous metals without needing any additionally incorporated liquids or grease. These properties make VCI film commonly used in metalworking or construction, autoparts, and steel industries. Additional sizes and gauges are available upon request.